This direct-drive vane vacuum pump has no belt. It is reliable, efficient, and safe, with no exposed moving parts, and none of the worries of belt-driven pumps. Operation is more precise and tolerances are reduced, for constant vacuum and smoother running which uses less oil. The silencer/oil reclaimer collects up to 95% of oil for careful disposal and reduces air borne oil particles. As the driving force of your milking system, reliability must be your No. 1 priority when choosing vacuum pumps. DeLaval vacuum pump DVP has reliability built in from the beginning. Direct-drive technology eliminates the worries associated with belt-driven pumps. Operation is more precise and tolerances are reduced, which means smoother running with less lubrication. In addition, the highly effective Cyclon Interceptor Vessel (CIV) protects the pump from any damage caused by water and solid particles in the air flow. Thanks to direct-drive technology from modern electric motors and more precise tolerance within the pump, DeLaval vacuum pump DVP delivers more vacuum per kW output. Smooth, easy running means fewer operational headaches. 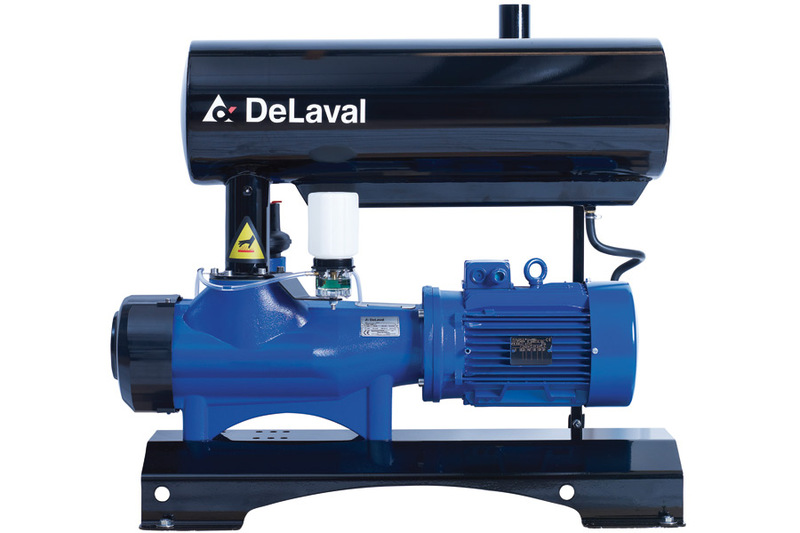 DeLaval vacuum pump DVP range includes four sizes: 800, 1200, 1600, and 2300. Their stable vacuum ensures that regulators, pulsators and milking clusters work optimally to give a smooth, comfortable milking of the cow. The result is better milk quality and higher farm productivity. DeLaval vacuum pump DVP service intervals also match those of other DeLaval milking components. All preventive maintenance can thus be carried out on the same occasion, which keeps service visits and costs to a minimum. DeLaval vacuum pump DVP uses less oil than other pumps. Greater technical precision means less lubrication, and an oil reclaimer is fitted as standard. The pump, however, is always lubricated with new, unused oil to ensure top performance. It is not hard to find an ideal place for DeLaval vacuum pumps close to the parlour. With direct-drive operation, DeLaval vacuum pump DVP is compact and ergonomic. The absence of exposed moving parts removes the need for bulky protective casings. This increases your choice of location and reduces the amount of piping needed. Installation is also easy. In addition to the pump and motor, DeLaval vacuum pump DVP is supplied with a Cyclon Interceptor Vessel (CIV), check valve, lubricator, piping and an oil reclaimer/silencer. Most components are factory-fitted to speed up installation and improve reliability. DeLaval vacuum pump DVP is safer than belt-driven vacuum equipment. You do not have to worry about the risk of getting trapped in any belts, and you avoid the work and expense of maintaining safety covers. There are no projecting parts to catch the unwary worker. Many farmers prefer a two-pump system. To meet this demand, yet still retain the installation advantages of a single pump, two DeLaval vacuum pumps DVP800 can be installed in the floor space normally needed for one.